Peace Tree Parks founders D’Andre Riggins (left) and Eric Andrews (right). Detroiters from the east to the west side are embracing the healthy food movement. 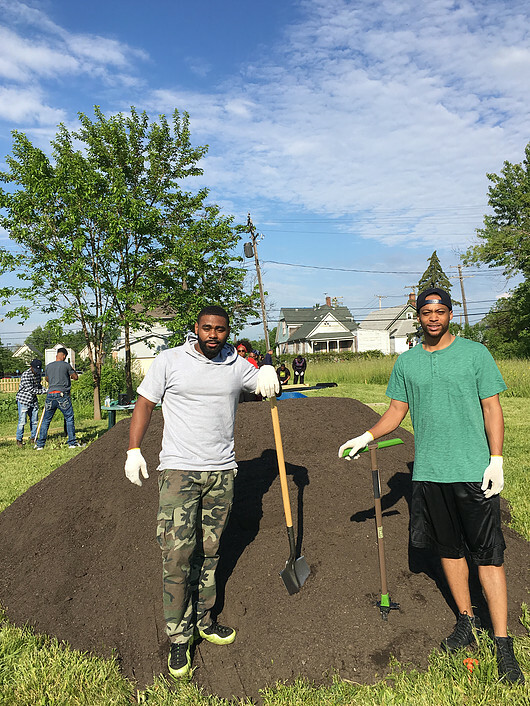 Peace Tree Parks is a non-profit organization founded in 2015 by native Detroiters D’Andre Riggins and Eric Andrews, with a mission of improving the access that Detroit residents have to fresh organic produce. The organization will hold its first Volunteer Day of the spring 2018 gardening season, Saturday, April 21st, to support their community give-back initiative. This event will be held at Peace Tree Park’s home garden (3781 14th St, Detroit, MI 48208) from 10-2 p.m. All ages are welcome to come out and help. Peace Tree Parks is collaborating with Blue Cross Complete and Wayne Metro Community Action Agency on this event. Volunteers will be able to refuel their energy with smoothies donated by Beyond Juicery + Eatery, chips provided by Better Made, and lunch provided by Chicken Shack. This Volunteer Day kicks off the first of many volunteer days which will be held every month to help with location development of the 14th Street organic garden, which is the core of the community give-back initiative. Everything grown in the garden is given back to the community. During volunteer days, volunteers will also help plant seeds for different crops that will help determine what seeds are given out to residential garden recipients. “Having access to healthier food choices will lead to healthier individuals within our communities and that is something we strive to encourage here at Blue Cross,” said Tyrone King, Community Relations for Blue Cross Complete. Volunteers are able to sign up by visiting www.peacetreeparks.org or emailing peacetreeparks@gmail.com.